Warshaw has two articles published in Diabetic Living's Summer 2010 issue. Article one, Barbecue Your Way, focuses on the how tos of enjoying BBQ, whether from North Carolina to Kansas City, or Texas...just a little bit healthier. Article two, Heart Smart from the Start, connects the dots between diabetes and heart disease and details 7 actions steps for heart (and diabetes) health. Do you (or a loved one) have type 2 diabetes and you’re under the impression that your blood glucose would rapidly fall into control if only you could just lose weight? Have you heard this promise from your healthcare provider (HCP)? As a dietitian and diabetes educator nothing would please me more than to be able to say this is true. But it’s often not the case and particularly so as type 2 progresses over the years. My message to you, stop dreaming and act NOW! The main mantra to people with type 2 diabetes, especially early on, used to be lose weight. Though losing 10 to 20 pounds can, especially early on after diagnosis, cause blood glucose to plummet and other medical problem to improve, research shows the continually pounding about weight loss that people often get from their health care provider needs to change. We know much more now about the progression of type 2.
confused about whether you need to limit the amount of carbohydrate you eat? baffled by what’s more important: controlling glucose, blood pressure or heart health? frustrated trying to lose weightl, keep pounds off and manage diabetes? overwhelmed by food labels, nutrition facts and ingredients lists? Diabetes Meal Planning Made Easy, now in its 5th edition, is thorough, yet practical and realistic in its approach. This perennial best-seller, published by the American Diabetes Association, has become the go-to resource on why, what and how much to eat for people with prediabetes or type 2 diabetes. Readers find cut-to-the-chase advice in three easy-to-digest sections. Section one is: Nutrition and Health Eating Basics. Section two is: Foods by Group, in-depth detail about each food group including alcoholic and non-alcoholic beverages, sweets and desserts and convenience foods. Section three is: Putting Healthy Eating for Diabetes Control into Action, covering how to preplan, supermarket shop, read food and nutrition labels, eat healthier restaurant meals and much more. This action oriented book helps readers slowly but surely change their food choices and eating behaviors for good. "I have used Diabetes Meal Planning Made Easy on a daily basis. I am a personal chef and suggest this book for everyone who wants to eat balanced meals and change their lifestyle. It is a winner, I love it." "Hope is the absolute authority on proper meal planning for people with diabetes. 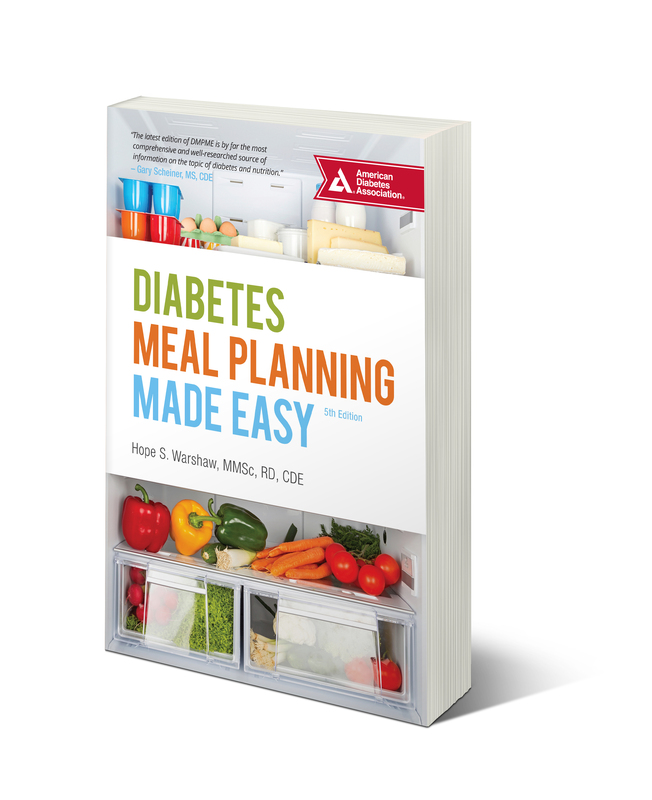 You will be able to manage well when you have Diabetes Meal Planning Made Easy on your shelf." "Hope has done it again! She provides practical tips in Diabetes Meal Planning Made Easy on enjoying food and managing diabetes."